Since I recently introduced millet into the repertoire of grains included on this website, I felt compelled to include a few tasty ways to use it! I began with a Millet 101, so to speak, explaining how I like to cook millet to avoid the mushy mess standard package directions may create. (Click here for the background and an easy how-to.) When I first created that aforementioned mushy mess–not ideal for a hearty salad such as Spring Millet Salad!–I realized that millet cooked a little longer than I desired for a salad would be quite suitable for a wholesome, satisfying option to hot cereals such as oatmeal or cream of wheat. I saw a basic recipe quite a while ago and retrieved it with excitement. (Click here to see the original.) Adding my milk of choice, some fresh fruit, nuts, and a drizzle of pure maple syrup turned this simple grain into a creamy, fruity, and mildly sweet breakfast option. Prepping the night before is a great way to ensure an enjoyable breakfast, as there never seems to be enough minutes in the morning! This porridge may be prepared the night before, refrigerated, and gently reheated in the morning for a speedy breakfast. Sometimes, I make a bigger batch and portion into several bowls for easy breakfasts throughout the week. When preparing in advance, simply remove from the heat about five minutes early as the millet will continue to absorb the liquid overnight and as it is reheated. Thank you, Terra! This is one of my favorite ways to eat millet and, if you are a fan of hot cereals, an especially delicious way to try it for the first time! I enjoy this nearly every day using berries that are in season and banana, sometimes nectarine and it tastes as good as this photo presents it. Wonderful. I am so glad, Cindy. Thank you for letting me know! Pingback: The Fountain Avenue Kitchen – How to Cook Millet…and a delicious salad recipe! I can’t wait to hear, Cindy! Thanks for the comment and have fun experimenting with all the options! So very creamy–I used 2% milk, 1/2 t vanilla paste and Penzey’s Cinnamon. It tasted quite like a rice pudding to me. I did not use raisins but instead topped it with half a thin sliced apple and 1T maple syrup. I would definitely make it again! Thanks for the great feedback, Jenn. I’m so glad you enjoyed and love your comparison to rice pudding! Pingback: The Fountain Avenue Kitchen – What are Buckwheat Groats…and what do you do with them? Have I bought the wrong grain? I have never soaked millet, as it is rather quick cooking. Did you cook the millet after soaking it? Or were you hoping the grains would absorb the liquid and become soft–like oats do–and not have to cook them? 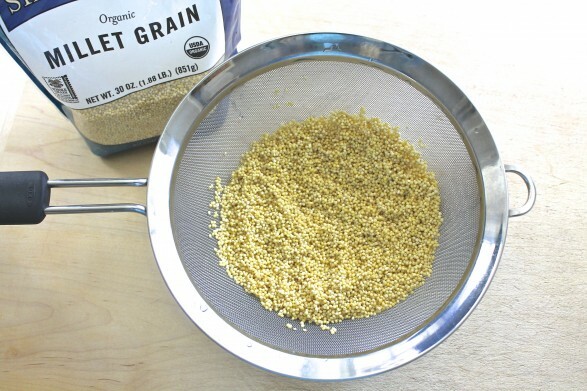 soak or sprout your millet for 8 – 24 hours prior to preparing it, so that you remove the phytic acid that binds up minerals and enzyme inhibitors that make it difficult to digest. Thanks for the suggestion, Mary. For anyone who might try this, I would recommend reducing the amount of water used. Also, the cooking time would likely be a bit shorter. I tried the millet porridge, it doesn’t look as light in color as the one in your picture and in another blog. It’s a little crunchy and i’m shocked by the amount of sugar needed but I can get past that, don’t know that I want to do any soaking of the grains but may try it the next time. I have come across warnings about not eating too much Millet because it can interfere with the thyroid hormone. Since I’m already hypothyroid, that is worrisome for me especially because I haven’t come across an article that states how many servings you need before it triggers this effect. How often do you serve this porridge? Millet has an inherent sweetness to it, so I never feel as though much sweetener needs to be added. It’s also rather quick cooking and, because of that, I haven’t soaked it. Perhaps the brand you bought is of a different quality than the ones I’ve used and the others you’ve seen pictures of–and that could also be the reason for the color variance? As for how millet reacts with the thyroid gland, I have not read anything to that effect. If you have questions, I would ask your doctor to be sure…or stick with grains you are certain are safe for you. I hope this helps! Thank you for taking the time to reply. I am using the Bob’s Red Mill Millet, it is definitely not sweet but despite it’s crunch, I enjoy the alternative to Grits. Re: the thyroid effect, I suspect you have read the goiterogenic (sp) information by now. I was so excited to find something other than Grits and then came across the articles about the caution re: overdoing Millet. It was a bit of a downer. I meant sweet as compared to the way certain grains are more bitter. And one more thought…did you cook the millet after soaking or did you soak instead of cooking? I was thinking that could be the reason for the crunch! I haven’t soaked but will try that next. I’ll let you know. Im a diabetic but love my breakfasts sweet, so I know what you mean about needing to add sugar. My trick is to leave sugar out and cut up fruit (especially strawberries or blueberries because of their low sugar content) and make sure a bit of fruit is on every spoonful. You’ll be surprised how much it sweetens every mouthful without any sugar at all. Stirring through a fresh passionfruit or coconut will also sweeten it up too. I too am a little conscious about overdoing millet because of thyroid issues. I think the literature on it is a bit sketchy but to be safe I just limit eating it to twice a week. Does anyone know whether this will freeze well in portions? I like to make a big batch of oat porridge for my toddler and heat it up in the morning. The oats work well, but it’s time for some variation! I haven’t frozen it but think it would work well–and be very convenient for your little one! I’m delighted you’ve made this multiple times, Sam. Thanks for taking a moment to let me know and for mentioning your tweaks! 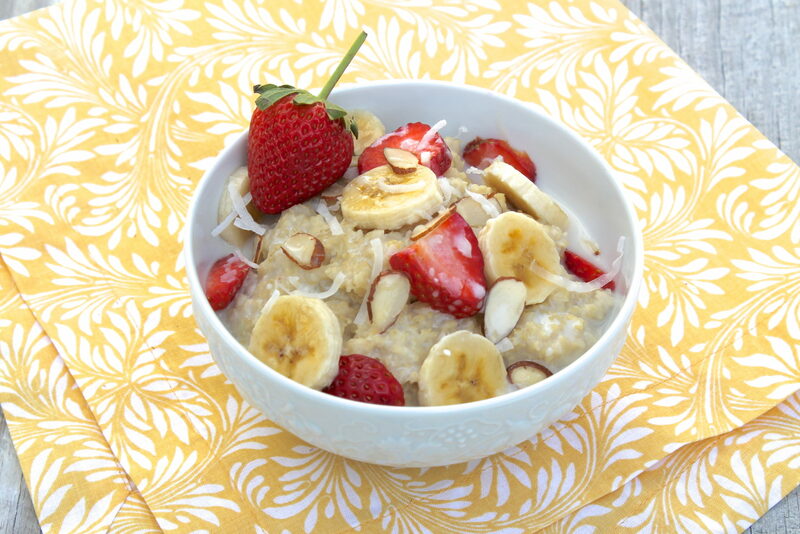 This weekend I cooked your Millet Breakfast Porridge recipe and quite liked it! I added more raisins and fresh raspberries. I added maple syrup on one day and found it too sweet. Definitely not needed when fruit is added. Thought I’d also share that a nutritionist recommended Millet over oats to me. Thank you for your recipe to start off my cooking with Millet. I’m delighted you found this recipe, Kim, and appreciate your feedback. So happy the porridge made for a good intro to millet! I made a large batch of millet porridge that was then not eaten. I did not want to throw it out so I put it in the freezer. Is it safe to eat, do you think? Jane, I haven’t frozen it myself, but it will definitely be safe to eat. The question would be whether the texture would break down somewhat. In that case, I might add a sprinkling of nuts to perk it up!